He claimed he had been given the eggs by the notorious egg collector Colin Watson. (Watson, you may recall died in tragic but irony-infused circumstances when he fell out of a 40 foot high larch tree while climbing to “look” at a Sparrowhawk nest in 2006). However, handwritten diaries enabled investigators to match individual eggs to specific incidents, and Pearson finally pleaded guilty yesterday at Skegness mag’s court to two counts of possessing wild birds eggs and three counts of taking eggs from the wild. So Pearson will be out of commission for the coming breeding season, for which we and countless rare breeding birds can breathe a collective sigh of relief. Will 23 weeks in prison and £1,500 be enough of a lesson to stop him from re-offending in future? It’s a compulsive activity, egg collecting, and clearly addictive. Watson, by the time of his death had amassed several convictions for egg collecting spanning 14 years, and had been fined in excess of £4,600. You do the math. Which leads me to a bizarre subculture – replica egg collecting. You what? 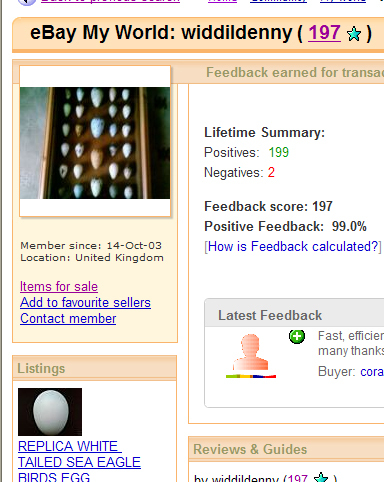 Yes, good old Ebay is the shopfront for scores of buyers and sellers of replica, hand-painted wild birds eggs. 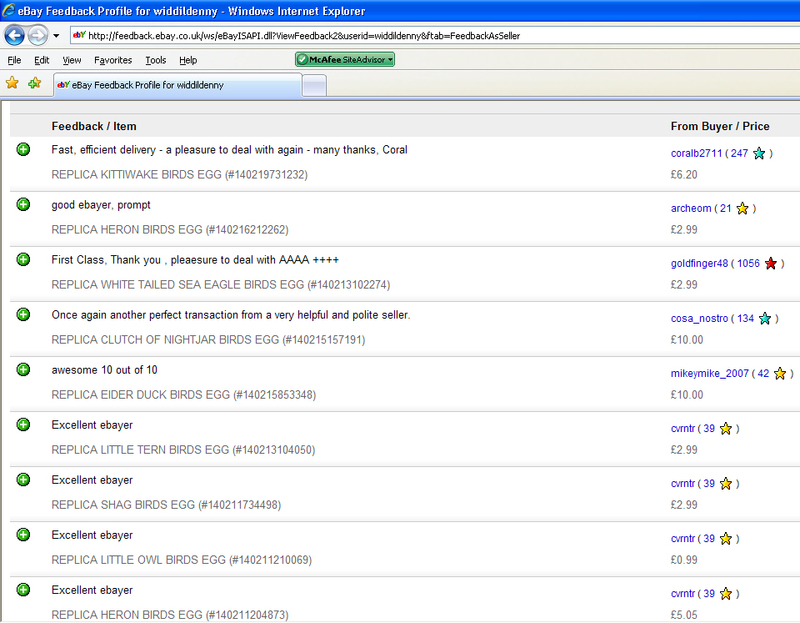 For example, meet widdildenny: http://myworld.ebay.co.uk/widdildenny/. Okay… I can appreciate that a tern’s egg is a beautiful thing, and I can just about understand how someone might, just might, want to possess an accurate replica of a particularly pretty egg, but why does an accurate replica of a Little Tern egg need to have the “feel of a blown egg”, and come complete with “blow holes at both ends”? Similarly, another seller (magicalbagofgoods) describes his wares as “ANATOMICALLY CORRECT IN SIZE,SHAPE & WEIGHT,COLOUR & LUSTRE TO THAT OF A BLOWN EGG”. So it’s not just the accurately reproduced markings on the eggshell that matter – being like a blown, collected from the wild egg seems to be terribly important too. If that’s not pandering to a very specific market, I don’t know what is.